Top Row: Tom Dublin, Kitty Sklar, Joyce Antler, Marge Murphy, Katherine Osburn. Middle Row: Melissa Doak, Elisabeth Perry, Hasia Diner, Karen Anderson, Nancy Hewitt. 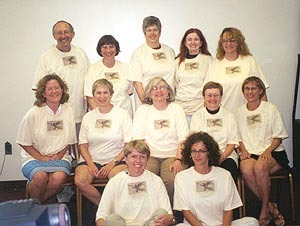 Bottom Row: Kris Lindenmeyer, Carol Lasser. As part of its current grant from the National Endowment for the Humanities, the Center for the Historical Study of Women and Gender sponsored a two-day training workshop on July 7-9, 2001, "Women and Social Movements in the United States: Expanding Resources on the Worldwide Web." The project entails the collaboration of Women's History faculty from twelve institutions across the country: Brandeis, New York University, Rutgers, Swarthmore, University of Maryland Baltimore County, Tennessee Technological University, Oberlin, Grinnell, St. Louis University, University of Northern Colorado, University of Arizona, and the University of California, Davis. The faculty have agreed to offer at their home institutions courses that give students an opportunity to do research on women in social movements in the United States using primary documents to create editorial projects for mounting on the worldwide web. At the workshop collaborating faculty explored the current website and shared insights that have emerged from working with undergraduates at SUNY Binghamton over the past four years. They discussed technological and pedagogical issues related to their teaching and as well as their plans for their own courses. Over the next three semesters they taught their courses and shared their student websites with the "Women and Social Movements" website. Altogether twleve document projects growing out of this collaboration have been published on the Women and Social Movements website. The collaboration marked a point of transition as the website moved from being a Binghamton student-based project to becoming a national online journal and website.